Rumors are swirling that it will be Oklahoma State and Ole Miss in the Cotton Bowl come January 2nd in Cowboys Stadium in Dallas. But according to the Cotton Bowl that won’t be official until the official announcement is made this coming Sunday during the BCS Selection Show. As sales for Cotton Bowl tickets are on the rise, it’s clear some fans think the expected matchup is more than just a rumor. So once you’re set to buy your tickets, the next decision is where to sit. 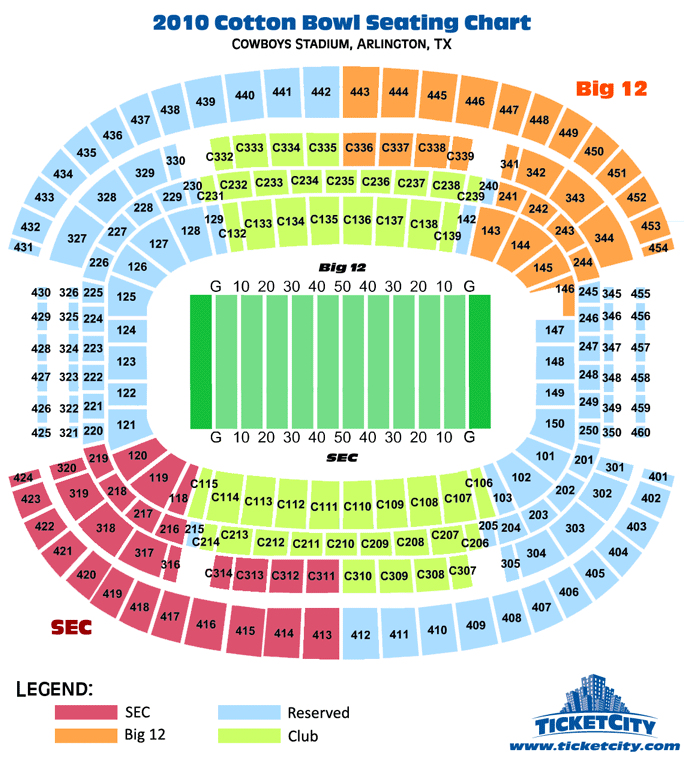 Below is a seating chart showing the Big 12 and SEC schools ticket allotment, as well as the club areas. What does a club seat get you? Club seats (C-sections) offer the best views in the stadium, but they also have roomier, cushioned seats, and provide you access to the private clubs for drinks and food. TicketCity can help you find the perfect seats, whether club level or reserved seating. TicketCity offers to tickets to all bowl games, including the BCS Championship. So whatever the team and wherever the game, let TicketCity help you be there for an unforgettable experience! Visit www.TicketCity.com or call 1.800.880.8886.